Did I find Shuttle debris? 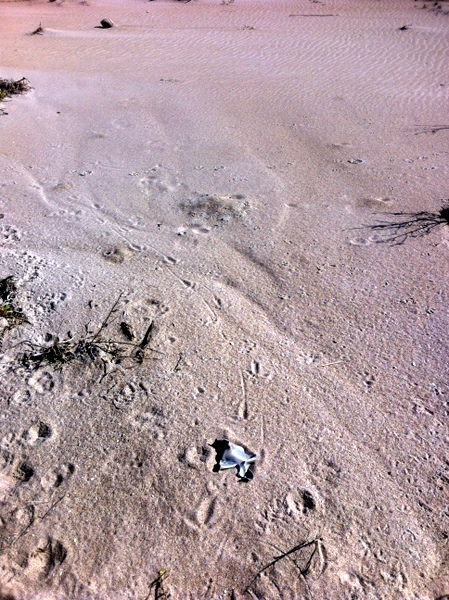 An Oddity found on the beach of Kennedy Space Center. 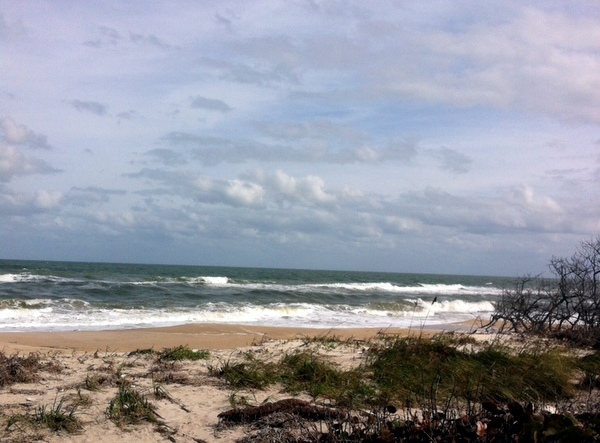 There are two beaches that you can 'legally visit'-if you have an KSC identification badge. Strange things wash ashore on a beach where rockets have blown up for 60 odd years. On cold Florida morning the Space Shuttle Challenger exploded shortly after launching from Pad 39A. A NASA video taken from the roof of the Vertical Assembly Building (VAB) filmed the event from launch to explosion and continued filming the shattered remnants as they dropped one by one into the Atlantic Ocean off shore from Kennedy Space Center. The video once classified is now available on You Tube for those who are interested in watching. My interest in the shuttle explosion and recovery of debris was suddenly increased by a visit to one of the two Kennedy Space Center beaches that you can legally visit (fish) ---if you possess a valid Kennedy Space Center identification badge. Monster Redfish caught by Bill on the Kennedy Space Center beach. 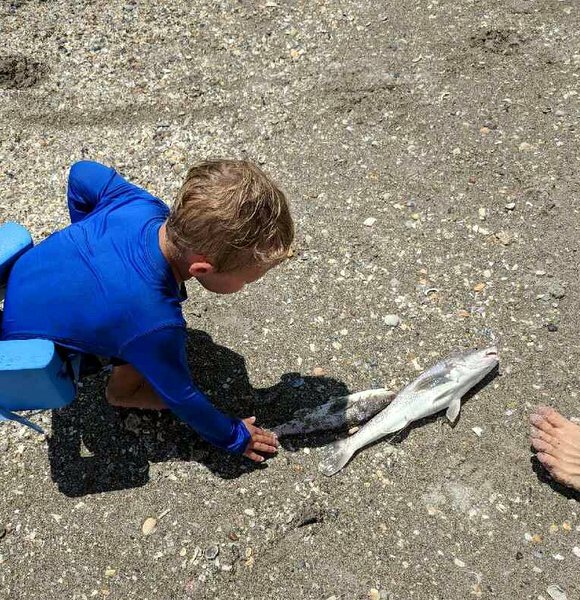 My grandson on the Kennedy Space Center beach inspecting a pair of whiting --easy to catch on the KSC shore. 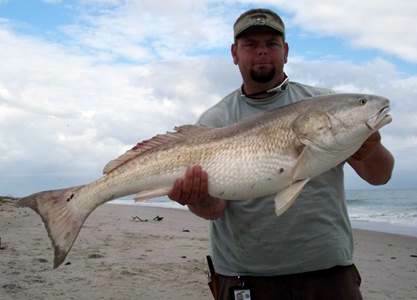 I go to these KSC beaches in hopes of a catching a monster surf redfish or snook-giant beasts that are in the surf if one is skillful enough to hook them. In other words-"I normally to run into schools of whiting or croakers and the monster trophy fish elude me -subtext: I get bored and begin shell hunting on the pristine KSC beaches where no other shell hunters are allowed to venture unless they also possess a space center or CCAFS Identification badge. After one such fishing/shell hunting trip I returned to the Internet to research shuttle debris from the Challenger explosion. I vaguely recall a newspaper article (pre-Internet) that not all of the shuttle debris had been recovered from the ocean. Completely understandable after watching the video of the explosion and the shattered pieces of the shuttle falling in a wide arc into the ocean. My internet search of Challenger debris pulled up a really interesting article about shuttle debris washing ashore in South Florida after a hurricane. -Wow Of course the Internet also talked about the Challenger debris on display at the Kennedy Space Center Visitors Complex-interesting photos. 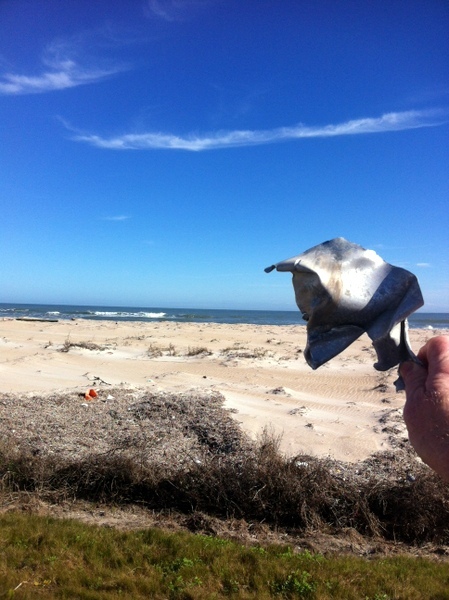 Had any Challenger debris/pieces parts ever washed ashore on the beaches of the space center? No information on the net. What had I found on the beach of KSC? 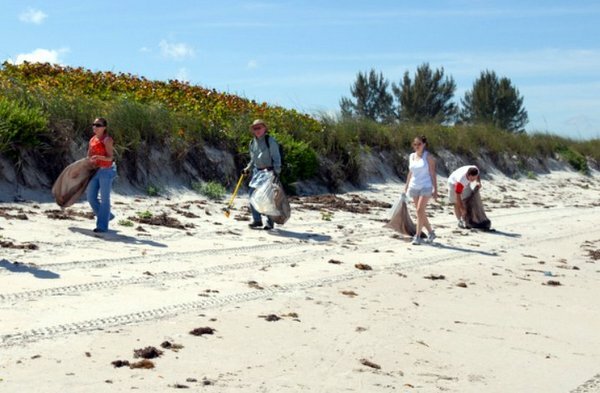 I had always volunteered to walk the isolated KSC Beach to pick up trash. I had not heard of any such Challenger finds and I had always volunteered to walk the KSC beach clean ups where employees of the space center and Park Rangers from Canaveral National Seashore worked together to clean trash from the undeveloped beaches of the space center-my thighs would be burning for days from all the squatting. Interesting trash-as trash goes; sea-beans and shells were always discovered on the normally off limits sections of KSC beaches. Anyway my day fishing and shell hunting on the space center beach had turned up an oddity (not Spanish gold or a French artifact from the nearby Jean Ribault Archeological site but a small section of twisted metal. Aluminum? Twisted from a rocket explosion? An Atlas or Delta explosion? The SpaceX explosion or even debris from the Challenger? What else besides an explosion twists metal in the manner of which I had just found? I recall the stories of Federal agents arresting people attempting to sell space shuttle parts on EBay --parts they had found but not reported. Would I get arrested for even possessing an item from the Challenger disaster? Dropped this hot potato back onto the beach! Wow, scary stuff. 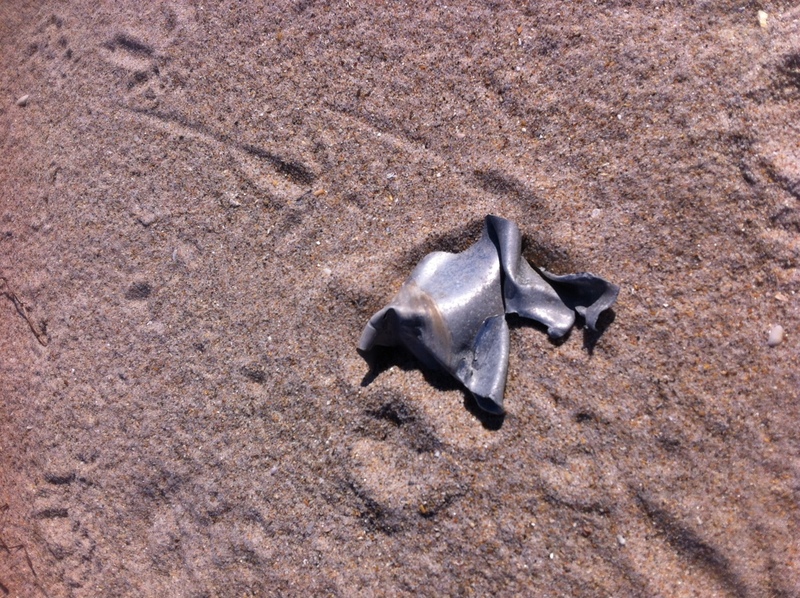 In the name of cowardice- I took photos of the twisted metal and then returned it to its place in the Canaveral sand. -Let another braver soul tackle that thorny issue. Admission: If I had found a roundish golden coin from some hurricane doomed treasure galleon (not completely out of the question) -----I would not be writing this story about my beach oddity discovery. 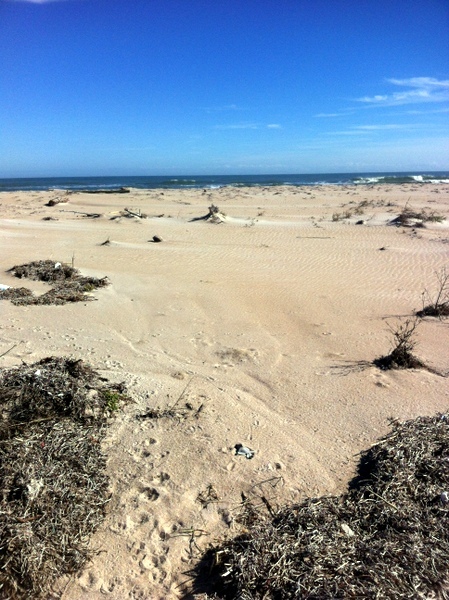 However-No gold yet & waiting on another beach clean up day. And there were always other fishing days on the beaches of Kennedy Space Center.